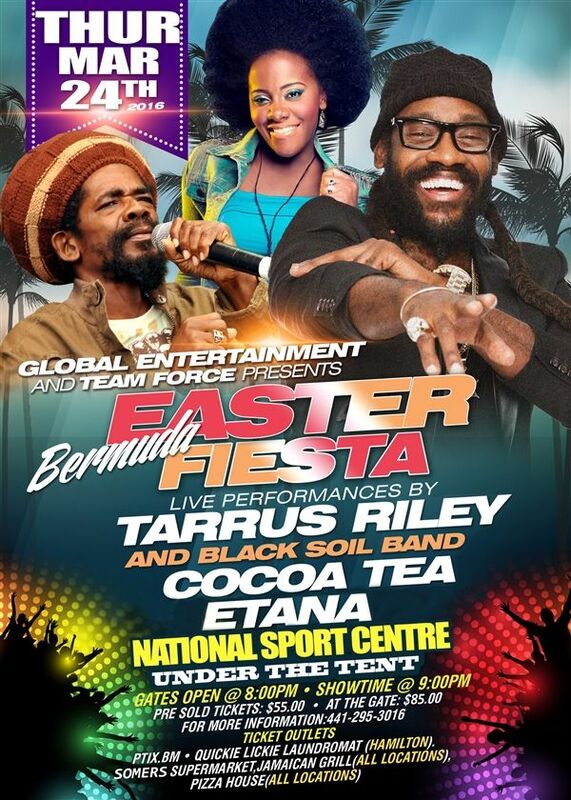 Global Entertainment and Team Force will present the Bermuda Easter Fiesta concert on Thursday, March 24, with charity organization Relay For Life to benefit from the showcase of international talent, including reggae singers Tarrus Riley, Cocoa Tea and Etana. The event will also feature local artist Jesse Seymour, as well as DJs King Jyrus and Juggling Jason, with Ninja Cutty hosting. Tickets for the concert are available ptix.bm, with Bernews giving away four more pairs of free tickets. The event will be held at the National Sports Centre, under the tent, with gates opening at 8.00pm and showtime at 9.00pm. The concert is being organized by Spectrum Global, run by Rosie Cross, who said, “The event will help Relay For Life because it supports cancer victims and survivors. Craig Tyrrell, Operations Manager at the National Sports Centre, said, “We are really looking forward to the concert and I would urge people to buy tickets to hear great music but to also support a fantastic cause. The Mission of Relay For Life of Bermuda is to raise awareness and funds to support cancer prevention and detection and to improve access to treatment with the local establishment of radiation therapy. For your chance to win a pair of free tickets to the event, keep an eye on the Bernews Facebook page, where we’ll be giving away four more pairs of tickets on selected days between now and March 23. When you see a post on the Bernews Facebook page asking a question about the concert’s performers, simply be the first person to answer correctly and a free pair of tickets is yours.